Economists say increased globalization and the decline in factory jobs play a major role in pushing prime-age men, particularly those with less education, out of the workforce. But that doesn’t explain why the problem is worse in the U.S. than in most other advanced nations. WASHINGTON — As the recovery from the Great Recession continues, job growth is solid and the labor force is growing at close to its fastest pace since 2000 because more unemployed workers are coming off the sidelines. Still, the percentage of working-age Americans in the labor force remains stuck near its lowest level since the late 1970s. Although retiring baby boomers are the main reason, there’s another troubling factor that experts predict won’t be solved by stronger economic growth. Too many men in their prime don’t have a job and aren’t even looking for one. Experts trying to figure out the reasons are probing the roles of criminal background checks, painkillers and even video games. 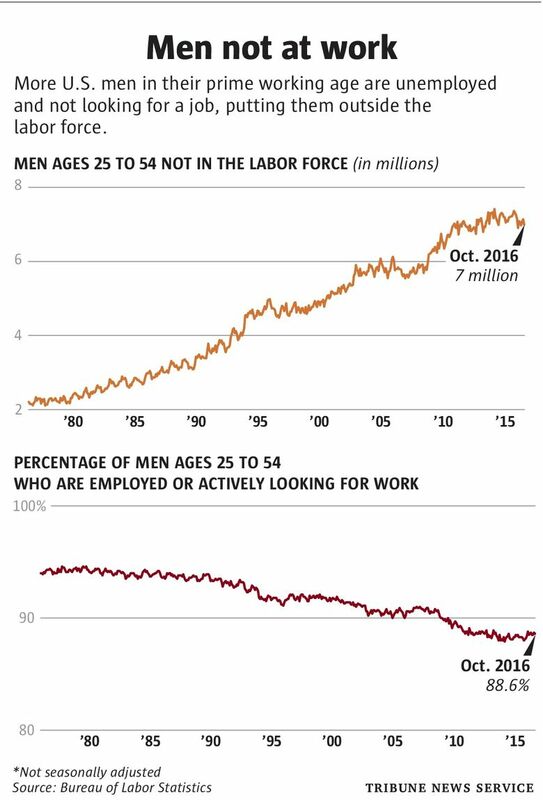 In all, about 7 million men ages 25 to 54 are neither employed nor “available for work,” putting them outside the labor force. Their growing numbers worry and puzzle economists. A little more than half of the men reported they were ill or disabled, according to the Bureau of Labor Statistics. About 14 percent are going to school. And about 20 percent said they were either retired or handling home responsibilities. Economists said increased globalization and the decline in factory jobs has played a major role in pushing prime-age men, particularly those with less education, out of the workforce. But that doesn’t explain why the problem is worse in the U.S. than in most other economically advanced nations. Researchers have pointed to some other potential explanations. Prime-age American men outside the labor force are spending more time playing video games, making leisure time more enjoyable. About half are in so much pain from physical maladies that they take daily medication for it, making holding a job difficult. And in a problem drawing more attention from economists, the nation’s high incarceration rate has left many men with felony convictions that raise red flags during employer background checks. While the reasons may be up for debate, having so many men failing to contribute has troubling implications for the economy. The problem has been building for a long time. The percentage of prime-age men in the U.S. workforce — those either with a job or actively looking for one — peaked at 97.9 percent in 1954. But since the mid-1960s, the labor-force participation rate for those men has steadily declined. The rate has varied during economic booms and busts but generally has been on a downward trend. The rate bottomed out at 88 percent in 2014 and has been hovering near there ever since. The figure was 88.6 percent in October. The labor-force participation rate for women rose sharply from the mid-1960s through the 1980s as it became more socially acceptable for them to work. But the rate for women has fallen off in recent years, too, to 56.8 percent in October. The overall participation rate for men and women older than 16 years old was 62.8 percent last month. The Obama administration was concerned enough about the trend and its implications that the White House Council of Economic Advisers issued a 47-page report this summer examining the reasons for the decline and policies that could help address it. Eberstadt wrote a book on the subject, “Men Without Work: America’s Invisible Crisis,” that was published in September. And economists have been studying the phenomenon. Krueger, who chaired the White House Council of Economic Advisers from 2011 to 2013, added to the debate over the issue by conducting a survey that found that 47 percent of prime-age men who are out of the workforce said they took pain medication the previous day. Nearly two-thirds of those reported that they took prescription painkillers. When asked if pain prevented them from working at a full-time job, 40 percent of prime-age men out of the workforce said yes, Krueger found. He said he hasn’t been able to determine if the pain problems are a cause or an effect for the men being out of the workforce. Research this year by Krueger’s Princeton colleague, economist Mark Aguiar, pointed to another potential reason — the lure of video games. Video games have become more elaborate and sophisticated, while online gaming has expanded the universe of people to play against. Men ages 21 to 30 who were not in the workforce reported spending an average of 6.7 hours a week playing video games from 2012 to 2015, compared with just 3.6 hours from 2000 to 2007. The figures are higher for men in that age group with less than a college education. Erik Hurst, a University of Chicago economist, found that those men spent an average of two hours a day on video games in 2014, with 10 percent of them reporting playing for six hours a day. About 7 in 10 lower-skilled men in their 20s without a job lived with a parent or close relative, according to his research. But despite that, they reported being happier on average than they were in the early 2000s. “The life of these nonworking, lower-skilled young men looks like what my son wishes his life was like now: not in school, not at work, and lots of video games,” Hurst wrote recently.